EDWARDS, Mary. The History of France, From the Earliest Period To The Pacification of Paris in 1815. London: Printed by J. Barfield, 1825. In two volumes. First edition. 8vo., full contemporary calf, viii, 370, errata; (371)-752pp. Spines faded outer hinge of volume two tender (not cracked) but otherwise a near fine set of this scarce work. Not is Osborne, BM catalogue. This work was designed by the author for her teaching of history to her students. She dedicates the book to the "Miss Sudells" noting that it "assisted you in your early history studies." 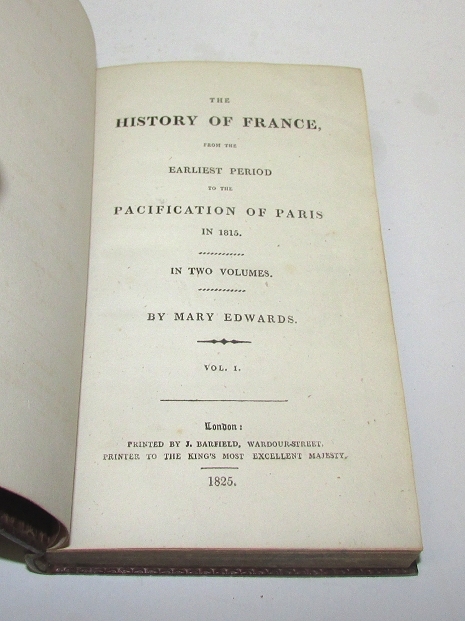 The introduction states that "the following brief sketch of the history of France... was originally compiled for the express and sole use of the Miss Sudells of Woodfold Park, Lancashire, and was used by them in manuscript; but a few copies of it are now printed at the request of Mrs. and the Miss Edward's numerous young friends."